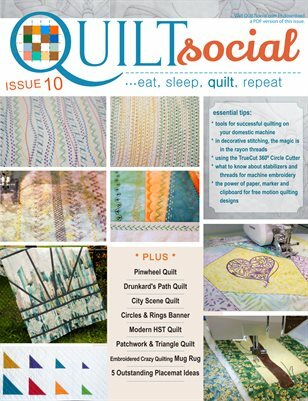 Welcome to a new issue of QUILTsocial! I'm so excited to share with you tips, tutorials and product reviews in this issue and I'm even more excited you'll be able to download it for future reference! Among the several projects 5 of them are created by playing with rulers: a square, a triangle and a circular cutter. My favorite is the triangle ruler, as it simplifies and shortens the time it takes to make half square triangles, substantially. Another must-read feature is about using the lowly placemat as a creative platform and learning tool to discover different quilting techniques and embroidery possibilities. Also you don't want to miss the 9 essential tools for successful quilting on your domestic machine, guidelines that will change your quilting possibilities. Let me highlight one more, you know those quilt panels you love so much and hate to cut up into a quilt? We offer tips about how to cut these so the images are highlighted instead of lost. Enjoy exploring everything in this amazing issue!